The illicit drug trade touches millions of lives in both developed and developing countries. Its most negative impact is concentrated amongst the vulnerable and marginalized of our societies. The UN estimates that some 180 million people worldwide - 4.2 per cent of people aged 15 years and above - were consuming drugs in the late 1990s; this figure includes 144 million consuming cannabis, 29 million people consuming amphetaminetype stimulants, 14 million people taking cocaine and 13 million people abusing opiates, 9 million of whom were addicted to heroin. Economic reliance on the drug trade, and drug addiction, leaves many individuals open to exploitation by criminals and criminal organisations; threatening the health of men, women and children, the rule of law, and ultimately, the vitality and strength of all our communities. However, for the first time in recent history, global production of drugs such as heroin and cocaine is no longer growing, but shows signs of stabilization and even decline. Global coca leaf and cocaine manufacture continued to fall in 1999 by 7 per cent and was 20 per cent lower than in 1992/93. Illicit opium production, the raw material for the manufacture of morphine and heroin, declined in 2000 by at least 17 per cent and was some 15 per cent lower than in 1994. Production of opium poppy and coca leaf is concentrated in an ever smaller number of countries. This makes concerted efforts, assisted by alternative development, an increasingly viable option to achieve the targets set out in the 1998 Special Session of the General Assembly which aim at a substantial reduction if not elimination of such production by the year 2008. Progress is also being reported from the demand side, where there are signs of stabilization or even decline in some of the main markets. With this Report, the United Nations Office on Drugs and Crime describes and explains the extent and development of this complex problem-and the important progress that has been made in recent years towards its amelioration. 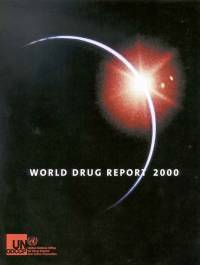 Illustrated with numerous maps, graphs, charts and tables, the World Drug Report 2000 provides the reader with a unique insight into the realities of the international drug problem and reveals the most complete picture of the extent of the problem.